2011 update: I am currently beginning to play my harps again after a long break, (due to some muscle injuries). I am still very interested in harps, especially Early and Celtic music for harp. My book is still for sale- At present, I am the only person selling this book, and there are only a few copies left. I don't know if I will reprint it after these are gone. Dragon Tales/Creature Kinships P.O. Box 347 Norwich, Vermont 05055 U.S.A. If ordering from Canada, add $6.00 U.S.dollars shipping and handling If ordering from anywhere else, add $ 8.00 U.S. dollars shipping and handling. Please make checks payable to Cynthia J Crawford. This is a book of music transcribed from the Straloch and Rowalllan lute manuscripts with a short introduction, bibliography, discography and music reference. I expect to write more about this music for various journals at a later date. I will post a notice if that occurs. This is some of the music on Robin Williamson's two albums "Legacy of the Scottish Harpers", on Scottish lute recordings by Ronn McFarlane, Jakob Lindberg, Paul O'Dette, the Baltimore Consort, and the Rowallen Consort, with Bill Taylor, wire harp. and Robert Phillips, lute. 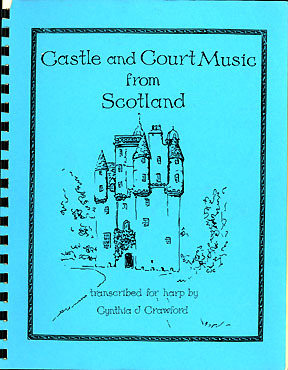 My husband, Wayne Cripps, has published all of this music in 2 volumes, written in lute tablature in the original keys. Thank you for your interest. I have had many requests for info. and orders. I will try to answer individual questions not covered in this message as soon as possible. Its a wonder to see. I Long for thy virginitie.